Real Talk, Real Time Young will be rescheduled for April. Please email youngadult@uulacrosse.org to be placed on the email list for this group. 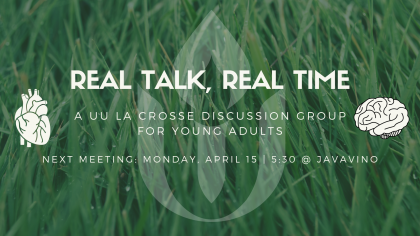 Join us for Real Talk, Real Time, a new young adult discussion group from UU La Crosse, where we talk about the real things in life. We will be meeting at JavaVino – there’s time to order food and drinks at 5:30 with discussion to start around 5:45-6pm. Anyone aged 18-35 is welcome to engage in self-exploration through guided discussion. The theme for April is “Wholeness”. Sign up soon, only 8 spots are available.